After a few technological glitches, I am back online and posting. Sometimes the technology gremlins get the best of us. I have some great posts from the past few weeks that will be coming your way. Here is a story of how a Transformer Prime owner used his tablet to take images of the moon. I also have a Prime and use it to control my mount for astrophotography using this great program from Souther Stars SkySafari Pro (both fro iOS and Android) and the Blutooth adapter that they also sell. There are a lot of other astronomy programs, both free and for pay, that are available. Also, there is a great program that will allow you to control your Canon camera from your phone/tablet. This combined with SkySafari equals a portable astrophotography setup that is hard to beat. Let me know if you have a favorite tablet/smartphone astronomy program. Posted in Play and No Work. Tagged Android, Apple, astronomy, astrophotography, ios, smartphone, tablet. On Thursday, May 31, 2012 from 12pm-2pm (ET), Bill Brutacao, a intellectual property litigation attorney at my firm is presenting a free, live webinar on IP & Copyright law best practices. Bill is very experienced and can help you and your business travel the road to understanding and protecting you IP. You can register for free here. If you have any copyright or intellectual property questions and are not able to attend the webinar, please contact me for a free consultation. Posted in Work and No Play. Tagged Copyright, intellectual property, IP, patents, trademarks. That picture sure looks like an elephant, but in reality it is just an unusual geological structure on the surface of the red planet. The High-Resolution Imaging Science Experiment (HiRISE) aboard NASA’s Mars Reconnaissance Orbiter (MRO) captured the image during its mission. It seems like everyone is focused on our red neighbor and there is a lot of activity currently happening, and soon to be happening on Mars. I wasn’t really aware of how large some of the rovers that we have successfully landed on Mars were until this last Saturday during Jared Head’s talk. The sizes are quite impressive. 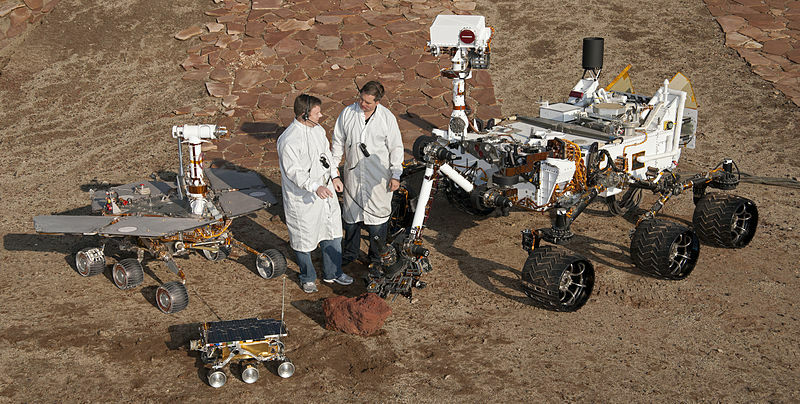 The mid-sized rover on the left is a model of the two mars rovers Spirit and Opportunity. Although Spirit is no longer operational, Opportunity has been operational on Mars for 9 years. Nine years! The original mission for both the rovers was only 90 days. Considering that Mars temperatures average -55 °C (−67 °F), and there is a LOT of dust that can mess up electronics, the durability of these vehicles is amazing. Opportunity is currently parked for the winter (about −125 °C or −193 °F, way too cold for me) waiting for a nice dust devil to clean its solar panels and continue on its mission. If you would like to find out more about everything Mars head on over to the Mars Science Labratory for lots of activities and information for kids and adults. Posted in Play and No Work. Tagged labratory, Mars, rovers, science. End of the App Lock-In? As I was perusing my favorite technology blogs regarding, various smartphones, I was interested in the new Windows Phone 7 (WP7) Nokia Lumia 900 reviews. I noticed that every article mentioned how fast it was on a single core device. The constant reference to the single core brought out the attorney in me, so I did a little investigating. It seems that there is no multitasking for applications in WP7. Not a terrible limitation by any means. However, I personally have looked at the Nokia and other WP7 phones along with Windows 8 and have no desire to have a Duplo/Lego phone that does more to annoy me than accomplish my work. Your mileage and preferences may vary so don’t hate me because I don’t like your phone. That being said, it dawned on me that if the new processors in phone and tablets were powerful enough, there is the opportunity to provide virtualization. Virtualization on a phone or tablet would allow you to run multiple operating systems. With the right set of hardware and software, a smartphone or tablet could run all the different segregated Apps. This would mean a user would be able to run iOS , Android, Blackberry, WP7 apps on a single platform. Just think one OS to rule all them all. Is this the wave of the future, buy one, run all? Or is this just a pipe dream. Cast your vote in my poll. If you have any software, hardware or Internet questions, please contact me for a free consultation. Posted in Work and Play. Tagged Android, Apple, computers, ipad, iphone, Microsoft, phone, tablet, Windows, wp7. Ok, so I am trying out the Sunspot theme. I like it, but it may be a little to dark. Send me a comment on whether or not I should keep this look, or keep trying. Last night was the monthly meeting for the Riverside Astronomical Society and our guest speaker was Jared Head from the Columbia Memorial Space Center in Downey California. I actually wasn’t aware of the center and was pleasantly surprised by everything that they offer. It is a hands on museum with lots of activities for everyone and every age. Their current travelling exhibition of space suits from NASA ends April 29th, so you better hurry if you want to see (and feel) what an actual space suit is like. Also, check out their schedule for upcoming events. If you have children, this is a great way to introduce them to science and the wonders of the universe. I highly recommend a visit. Posted in Play and No Work. Tagged Astronomical, astronomy, center, columbia, meeting, memorial, Riverside, science, Society, space.